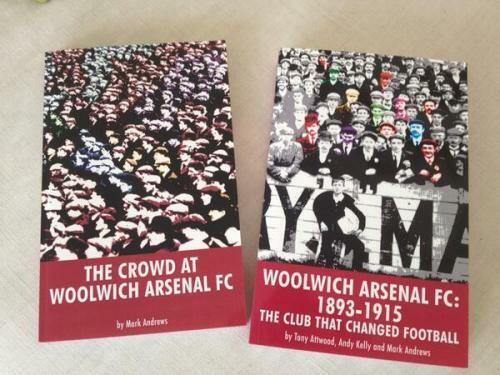 If you’re an Arsenal fan that has been to a game any time in the last 80 odd years, the chances are you will have used or walked past Arsenal underground station. 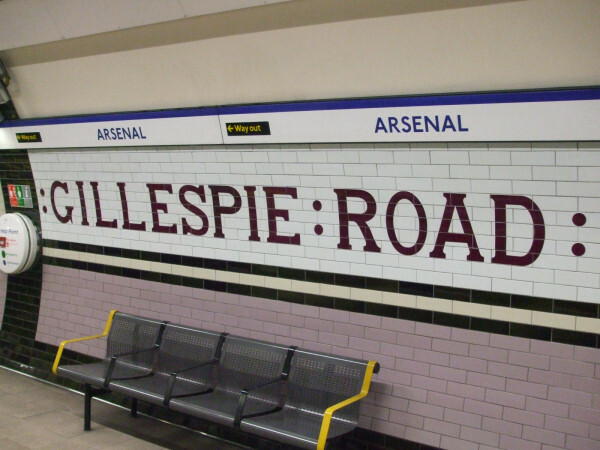 And if you’re an Arsenal fan with an interest in the club’s history you will, no doubt, know that it was originally called Gillespie Road and renamed to Arsenal (Highbury Hill) on 5 November 1932. It was an idea of Herbert Chapman, Arsenal’s legendary manager, to raise the profile of the club. Here’s the story on Arsenal’s website. You’ll find that everywhere else that the story is told, the same date is used. The name change was actually made five days earlier, on 31 October 1932. Of course, we don’t expect you to believe this without proof and we’d be most disappointed if you were to accept any old hearsay as fact. So, here we go. First off is this item in the Sunderland Echo and Shipping Gazette dated 1 November 1932 which first alerted us to the possibility that the date previously believed stated wasn’t correct. Sunderland is a long way from London and we felt that we would need to investigate further to verify the details. So, we thought we’d look at some more sources. How about The Times, surely they are a reputable enough source? This story was printed on Wednesday 26 October 1932. 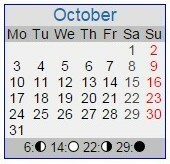 The following Monday that it refers to was 31 October. 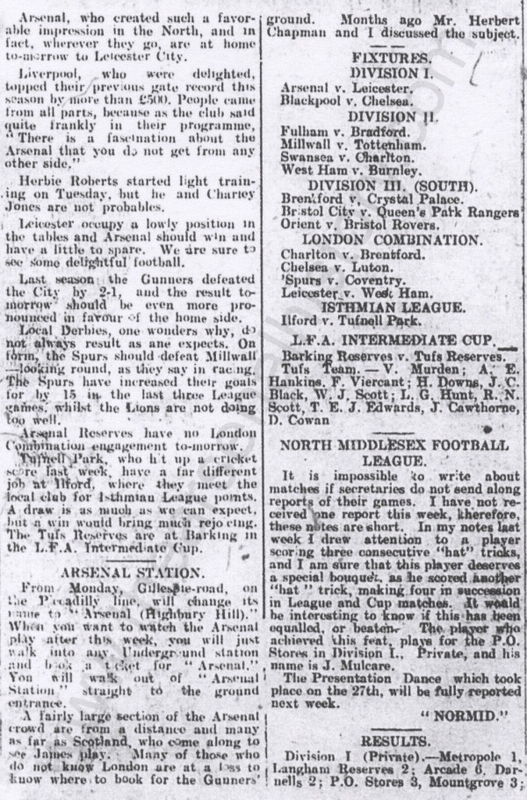 Arsenal’s local paper, the Islington Gazette, ran this story on 28 October. If you click on the story, it will open up showing it on the page with the date at the top. Again, this gives the date of the change as 31 October 1932. 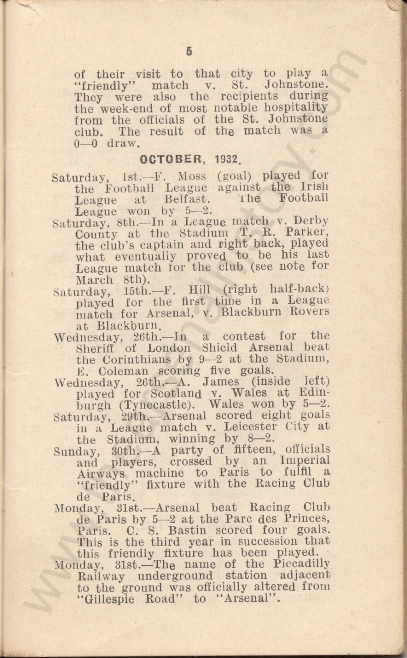 And then we have the Arsenal handbook published in 1933 which has a chronology of the season. 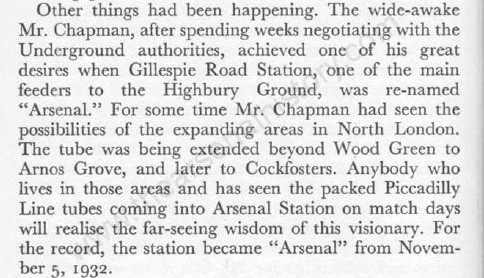 It appears that the erroneous date originated in Tom Whittaker’s autobiography “Arsenal Story” published shortly after his death in 1956. Whether this date came from Tom or from Roy Peskett, who wrote the book with him, we shall never know. However, it’s not right. We’ve also been asked about the costs associated with changing to the new name. 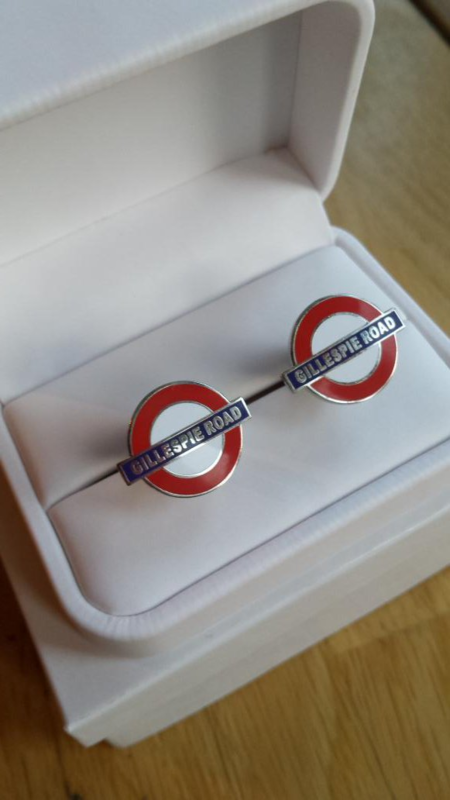 We’ve recently discovered that the London Electric Railway Company put forward two options. The first was that it estimated the cost to make the changes to signage, tickets, posters, etc would be approximately £1,000. LERC suggested that they were happy to bear two thirds of this cost if Arsenal weighed in with the other third. The second option was that changes would be made as stocks needed to be replenished and no charge would be incurred. Despite being known as the “Bank of England Club” the Arsenal directors preferred to opt for the latter. 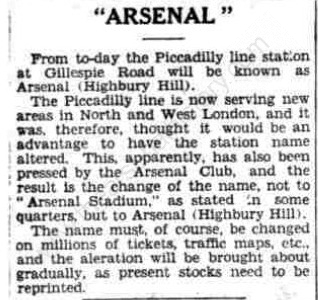 To complete the story, (Highbury Hill) was dropped from the name in 1960 and the station became “Arsenal”. This final piece of the jigsaw was provided by “John Bull” who writes for London Reconnections. John has written a very in-depth article for the latest edition of London Reconnections magazine where he, independently of us, came up with the same date that the station was renamed. He also pointed out that we also have “Woolwich Arsenal” on the DLR. Not one, but two stations connected to our great club! 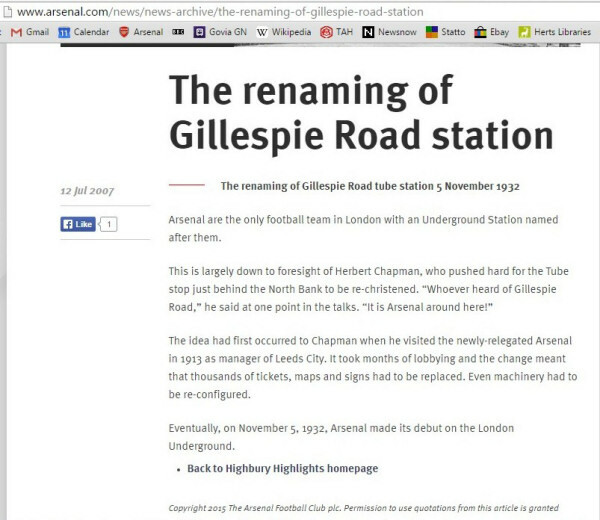 So, “happy renaming Arsenal underground station day”, this day in 1932 (not five days from now). 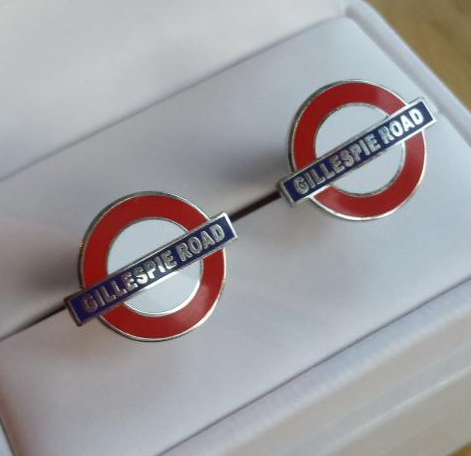 To commemorate this historic event, our good friends at SheWore have produced some Gillespie Road cufflinks which can be purchased from their online shop.